The George Washington University School of Medicine and Health Sciences (SMHS) PA program applauded its best and brightest during its annual awards ceremony and reception, Monday, Oct. 5, the campus kickoff to Physician Assistant (PA) Week — the nationwide celebration honoring the birthday of PA profession founder Eugene A. Stead, M.D., and the 50th anniversary of the first class of PAs beginning their training at Duke University. Karen Wright, Ph.D., interim chair, program director, and assistant professor of physician assistant studies at SMHS, opened the evening’s festivities with remarks on the value of PAs, as guests, including SMHS alumni, clinical preceptors, friends of the PA program, and PA faculty, staff and students, listened. 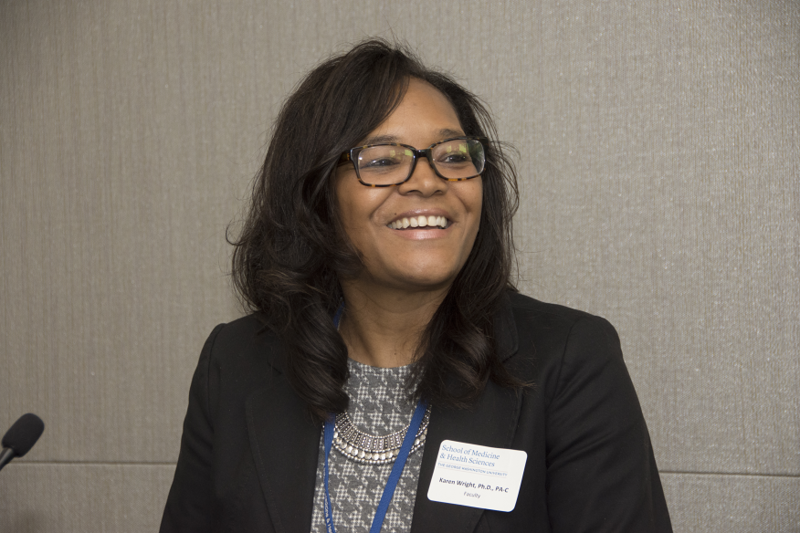 Doll, MPAS, PA-C ’88, clinical assistant professor of health sciences at SMHS, has been a tireless advocate for the PA profession, Landers told the audience as she added the GW PA Public Service Award to Doll’s many accomplishments. After graduating from GW, Doll completed the Norwalk Hospital/Yale New Haven Hospital Surgical Residency in 1989 and earned a master’s degree and a Certificate of Added Qualification in cardiac surgery. He has served as a leader in the PA community and acted as a preceptor and mentor for PA students. The second award winner, Michael D. Jacobson, MSHS, PA-C ’05, has also made an indelible mark on the next generation of PAs. Following Jacobson’s remarks, Wright invited John Colletta, Ph.D., to present the final award for the night: the Terrence E. Barr Memorial Scholarship. Barr, who grew up in the Ozarks of southwest Missouri, joined the Navy in 1966. After returning from Vietnam, he enrolled at the University of Florida, which was offering a degree for a new profession: physician assistant. “Being a PA was more than an act of patience for Terry, or even a career; it was his calling, and he loved it, and he helped a lot of people,” Colletta said. After the award ceremony and reception, PA Week events continued, with a bake sale, an American Red Cross blood drive, and an “Out of the Darkness Walk” for the American Foundation for Suicide Prevention. Fifty percent of the proceeds from the bake sale went to Miriam’s Kitchen, and several first-year PA students volunteered to work at the walk as a service and fundraising project.